Self-pity aside, moving to a campus apartment has been an interesting challenge. We lost more than half our square footage, overall. I'd bet my kitchen lost half it's square footage and at least two-thirds of it's counter space. See that picture, up there on the right? That's extent of my built-in counter space, these days. The nice part is we still have quite a bit of cabinet space and room to put up a shelving unit on the wall, opposite the oven; that acts like our pantry. A small kitchen doesn't mean we have to stop cooking good food. We've come up with a few solutions to increase our counter space and had to rethink the way we buy and store food, but it's working out pretty well so far. 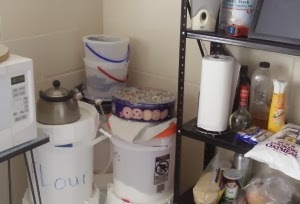 We brought an old aquarium stand with us that we turned into a table for the microwave, and we've stacked some of our flour, cereal, and sugar storage buckets in one corner. When not open, they provide temporary landings for bowls and such when I'm cooking, so that helps a bit. For more counter space, we got a few sink cut-outs. These are the left over material when kitchen counter manufacturers cut a space out for of a new counter top to make room for the sink. You can often get them for pretty cheap from a cabinet shop or, if you're lucky, from a friend or family member who happens to be a finish carpenter. You could just buy some finished wood from a lumber yard or home improvement store, if you needed to, although I suspect it would be more expensive. 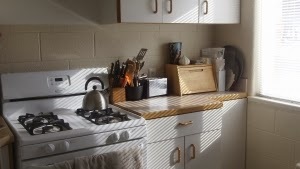 One sink cut-out sits on top of the microwave, turning that into counter space. We also have a larger one that we sometimes put on top the stove, to hold the dish strainer when we wash dishes and provide more space if needed. 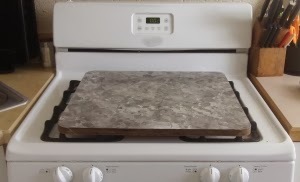 I just have to make sure I don't have the stove turned on at the same time. Speaking dishes, we have to do them completely by hand; we don't have a dishwasher anymore. Because of the limited counter space, it gets to be quite a mess if we don't keep up on them. Even though we've left a lot behind, I think things are going pretty well. We are all doing well in our respective schools and things are, mostly, settling in. One thing about going back to this school that appeals to my foodie nature is that it's an agricultural college. That means lots of college level food classes. Even though it's not part of my degree, the cheese making class has caught my attention. I'll get back to my new years celebrations, now. You should, too. I made four different kinds of dip, including garlic-hummus and some bread sticks. I'll try to share the recipes later. Happy New Year and too all, good eating.